Like new beautiful 1 bedroom condo on Marco Island. Located just 45 minutes from Fort Myers Airport, this unit is just across the street from the Gulf of Mexico. With private gated access to the white sandy beach, you truly are 'Steps from the Beach.' The 1 bedroom has a queen bed w/dresser and a large closet. The fully equipped kitchen area has a full size stove, microwave, dishwasher and refrigerator. The living area has a 27' TV w/VCR and a queen size sleeper sofa. You can enjoy the beautiful view of the pool, gulf waters and tropical foliage while relaxing on the screened in lanai. There are 3 Social/Common areas w/a big screen TV, tables, chairs and couches. Amenities include: Pool w/sundeck, BBQ area, exercise room, washer/dryer facilities and a covered parking space. Experience the beauty and serenity of Marco Island. A perfect place for you to relax with plenty of things to see and do. BR B Amenities: /B BR Kitchen accessories, beach chairs, coolers, linens, etc. Bernie and Sheryl Weber have been providing vacation rentals in the Southern Gulf Coast of Florida since 2002. We currently have 3 rental properties. 1 bedroom 1 bath condo with private beach access on Marco Island (HomeAway #316123) 2 bedroom 2 bath condo in the beautiful Cape Harbour complex (HomeAway #192447) 4 bedroon 2 bath canal Villa with boat dock, private pool and hot tub (HomeAway #316125) If you are ever interested in any of these properties, please contact me for more information. Location! Location! Location! 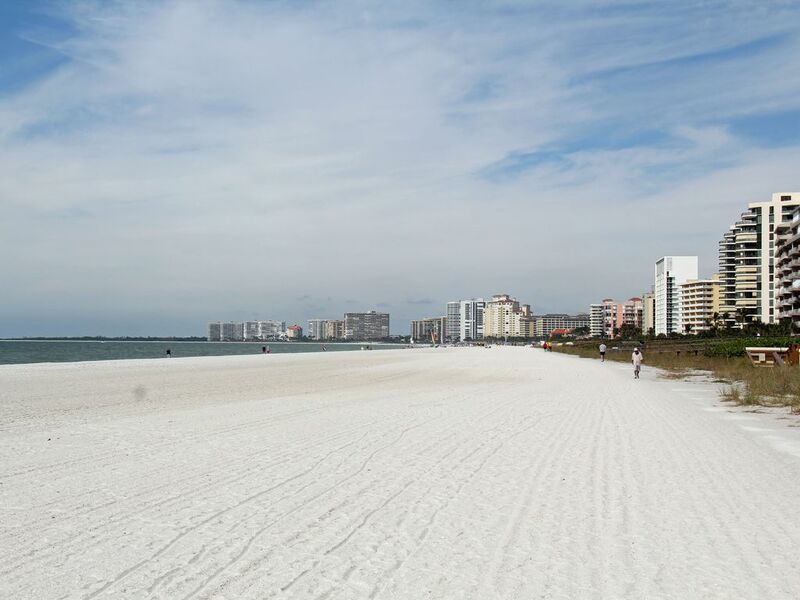 This condo is located directly across the street from the Gulf of Mexico and priced right. With it's own 'Private Beach Access' you are truly steps to the beach. We have our own private beach access. No need to walk to any public access beaches. Private beach access just across the street. Bernie’s unit was wonderful!!!! Great Location! Great Pool! Bob and I had a wonderful time!!! Would definitely recommend this place! Went by way to fast! Thank you Bernie! Location couldn’t have been better! View was wonderful! Condo had everything you needed for a wonderful stay! Perfect condo for 2 adults. Comfortable, clean. Close to beach. Beach towels, chairs and umbrella available for use. Nice screened in balcony over looks pool down below, with glimpses of gulf across the street. Main complaint was the WiFi did not work in the room and husband was trying to work remotely. Bernie got back to us quickly the first day regading this problem , but we never did resolve WiFi issue. Other people staying in the building said they had no WiFi problems. Tenant also responsible for dish soap, laundry soap, toilet paper, and garbage bags. Would have preferred to pay an extra dollar or two each night for the convenience of not having to shop/plan for those essentials. Was a pleasant stay, would recommend this place. A new router was installed and the WiFi works great again. Beautiful condo with private beach access. Great experience! Location is great. Well kept condo. Private parking. Private beach access immediately across the street. Proximity to restaurants is fantastic as well. Nice property, complex amenities were good. The apartment was nice but has several things the Owner appears to not be aware of. The kitchen utensils (can openers are broken),the WiFi does not work at all, the toilet has not been serviced in years does not flush properly,TV remotes increase and decrease the volumes when you change channels sometime they work other times they don’t. No batteries in remotes, there is a leak in the refrigerator that has a carafe to collect the drip (don’t move it as it will flood your food!). The Owner is in Chicago and will take your calls but appears to be more surprised than willing to take action. It’s a shame as I am a frequent traveler and will likely stay away from this unit. With a family of 4 and two teens that love their devices my tethering bill alone is going to surpass the stay cost. In addition the sofa bed was full of sand and not cleaned properly. Maybe I expect much but the details do matter when you want to provide an outstanding vacation stay. This property would be fantastic if these items could be addressed. We appreciate your feedback and listened. The kitchen utensils along with pots, pans, glasses and toaster were all replaced. The WiFi box was replaced and the internet works fine. A complete toilet has has been replaced and flushes perfectly. TV remotes and TVs all work well now. A brand new refrigerator with ice maker has been installed. I would hope to hear from you again. The property has the complete feel of an island condo. Super convenient that the condo is located right on the main drag of the Island. Restaurants and the beach within short walking distance. Will look to stay here again if I make it out to Marco Island again. The owner was great to work with and answered all of my questions when I called before booking. Holiday dates may have an up charge and will be included in the quoted rates. AN UPFRONT SECURITY DEPOSIT OF $250.OO CAN BE USED IN LIEW OF THE $59.00 DAMAGE PROTECTION. LET OWNER KNOW AT TIME OF BOOKING.